The first project I undertook in the new house was the gallery wall in my bedroom. I wanted this room to be my haven, and what better way to do that then to be surrounded with beautiful pictures of people and places I love! I spent virtually all summer picking out my favorite photos to go on the wall and finding the perfect frames/prints. The result is a focal wall that absolutely overflows my heart with love, joy, and hope when I look at it! I knew I wanted something very organic and something I can add to and modify over time. I bought tons of different styles of frames in different shades of white. Most are 12x12 basic white frames from Target (I removed the mats and went with full frame look). I also got a few rustic wood frames by Face to Face Home from one of my favorite local shops- Bungalow Home. A couple of the beach prints I custom ordered online with the frames (see the links below). Everything is a little different, but it all comes together perfectly. 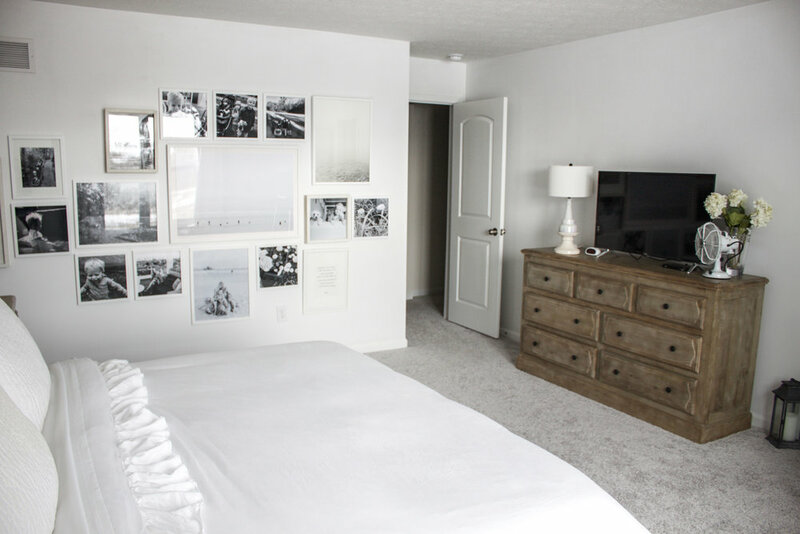 When it came to hanging the frames on the wall, I pretty much winged it and just went with what felt good and what was pleasing to the eye, rather than precisely planning, mapping, and measuring everything out. (That being said, I did use a level!) I started by spreading out the pictures along the length of the wall and then filled in with the smaller pictures. It is still a work in progress, but even knowing there are blank spaces for future memories brings me joy when I look at it! Overall, I just love waking up and falling asleep to these happy, beautiful, inspiring images and quotes. The best way to start and end a day is with gratitude, and this definitely helps to foster that! I got this framed print “Breathe” by Emily Denis from Minted. I got the sign “That which does not Kill Us Makes us Stronger” from Face to Face Home. I got the framed print “Lineup” from Lauren Marttila Photography, which is the centerpiece of the whole wall. I got a couple of the the weathered wood “Case” frames from Face to Face Home as well.